A full blown Crossfire system for less than a grand. We prefer to roll our own rigs, but there are situations where a pre-built makes sense. Maybe you don't have the time to build your own system, or you're making a recommendation for a friend or family member and don't want to be held responsible for every little issue that pops up. Whatever the case might be, if you or someone you know is in the market for a pre-built system, there's a well-equipped Crossfire setup on Newegg that is on sale for $850. 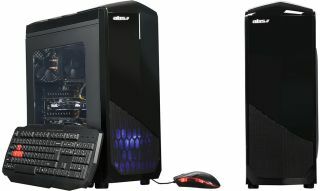 It is the ABS Sentry Duo (ALI105), a fully configured system that pairs an Intel Core i5-6600K processor with two Radeon RX 480 (4GB) graphics cards in Crossfire. Not all games play nice with Crossfire, but for those that do, a pair of RX 480 cards is a pretty potent combination. The system also has 16GB of DDR4 memory, plenty enough to handle today's games as well as content creation chores, like manipulating pictures in Photoshop. For storage, ABS equipped its Sentry Duo with a 120GB SSD for the OS and 1TB HDD for overflow. The front I/O panel is home to USB 3.0 and 2.0 ports (one each) and separate headphone and microphone jacks. Other connectivity consists of two rear USB 3.0 ports, two rear USB 2.0 ports, GbE LAN, and audio ports. All this is powered by a 650W PSU (no indication of efficiency, unfortunately). The system also comes with a USB keyboard and mouse. Windows 10 Home (64-bit) is included as well. A rough estimate puts the value of the individual parts at around $1,135, while the normal retail cost for the ABS Sentry Duo is $1,300. Newegg has it for sale for $900, and if you use coupon code 0117GNB250, it will knock another $50 off. So, $850 total for around $1,100 to $1,200 worth of hardware. Not too shabby! Go here to take advantage of the deal (it's good for today only).